Cross-border direct investment constitutes a substantial sector of the international financial market and is also an important vehicle for the transfer of technology and the modernisation of national economies. In recent years, international arbitration has gained a prominent role as a means of settlement of foreign investment disputes. The number and size of investment disputes under arbitration have risen significantly due to the growing number of bilateral investment treaties and increased use of arbitration under multilateral investment treaties. Arbitrating such disputes requires specialised skills and arbitrators with international experience. 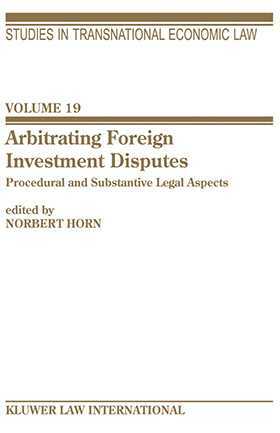 This new title, featuring contributions from leading experts in the field, deals with the procedural and substantive legal aspects of arbitrating foreign investment disputes. The chapters cover the basic framework of investment protection, the key notions of investment protection and examples and crucial aspects of arbitrating foreign investment disputes. For those involved with international investment arbitration, including practising lawyers, anyone doing business abroad and academics Arbitrating Foreign Investment Disputes: Procedural and Substantive Legal Aspects will provide high level analysis and accurate legal updates and assessments from around the world.